Communities in Schools got over 170 school supplies for the children in our local area. A big thanks to our wonderful community for helping our children. Cool off while helping Communities in Schools help the area students who are in need! Landa Parks & Recreation is a partner in helping get children ready for school. 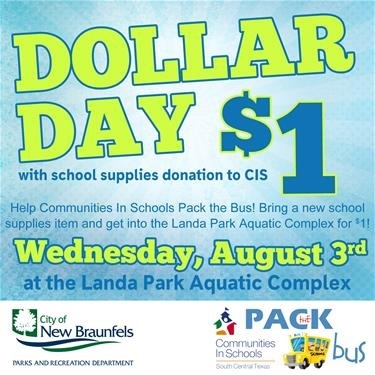 On August 3rd from noon until will 7:00pm, Landa Park Aquatic Complex is having a Dollar Day!! Supply school items and in exchange you will gain admission into the pool for just $1.00! What fun you can have for such a good cause! For more information, call: 830-221-4350. Every year the Communities in Schools hosts a yearly Pack the Bus school supply drive, collecting School Supplies for all the areas students who are in need. CIS works with communities & families they supply a network of support to help children in Comal & Guadalupe Counties, yearly, helping around 24,000 students in the New Braunfels, Comal, Schertz-Cibolo-Universal City, & Marion Independent School Districts. If you would like to help CIS in any way or want more information on this fantastic program, click here . The Children are our future lets help them make it a fantastic future! Thank you.